Manchester United's Marcus Rashford has dismissed suggestions that he was close to signing for Liverpool as a youngster. 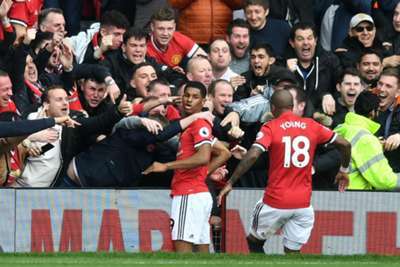 Rashford came through the academy ranks at United having joined the Red Devils aged seven, making his senior debut in February 2016 and going on to establish himself as a first-team regular at Old Trafford, and for England. And, ahead of United's Premier League clash with rivals Liverpool, Rashford – who scored a double in a 2-1 victory for Jose Mourinho's side the last time the two sides met – has insisted he never considered joining the Merseyside club. "No. Liverpool was never an option," Rashford, who learned his trade at amateur club Fletcher Moss, told Sky Sports. "Liverpool, City, Everton - there was no other club I really would have enjoyed going to other than United. It just felt the natural thing to do. "For a lot of us, United was the one. Everyone grew up a United fan and United and Fletcher Moss always had a good relationship, players in the past had made that switch, so United was natural." United sit in sixth heading into Sunday's encounter at Anfield, 16 points behind Jurgen Klopp's side.